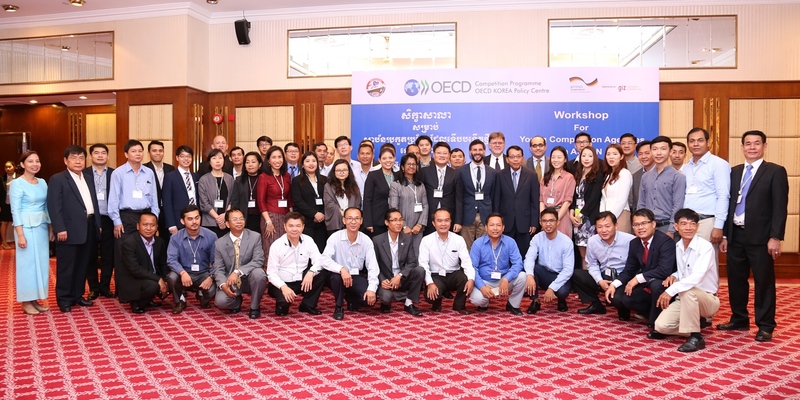 Phnom Penh, Cambodia – The Competition Department of the Directorate General of Import Export Inspection and Fraud Repression (CAMCONTROL) of the Ministry of Commerce of Cambodia in collaboration with OECD-Korea Policy Center and GIZ has jointly organized the Workshop for Young Competition Agencies in ASEAN on 03-04 November 2016 at InterContinental Hotel in Phnom Penh, Kingdom of Cambodia. The workshop was chaired by H.E. KEM Sithan, Secretary of State of the Ministry of Commerce, and participated by senior officials from relevant stakeholders who are actively participating in legal drafting including drafting competition law. The workshop was honorably presented by experienced speakers namely Prof. William Kovacic, Visiting Professor of King’s College London; Mr. Ruben Maximiano, Senior Competition Expert of OECD; Dr. Hassan Qaqaya, Senior Fellow, Melbourne Law School, Victoria, Australia; and Ms. Shila Dorai Raj, former CEO of the Malaysia Competition Commission. The aims of the workshop were to (i) develop competition law and policy framework we need, (ii) identify the benefits that the competition may bring, (iii) design the competition institution that works, (iv) set up the priorities for young competition agencies, and (v) foster competition culture in ASEAN region and in young competition agencies as well as in Cambodia . The workshop highly benefited to young competition agencies or to those who are in the process of drafting competition law to have more practical knowledge on how to design the effective competition institution and legal framework, especially Cambodia. Since the workshop was targeted to high-level officials from relevant ministries which are mostly involved in law/policy making, thus it is a good chance to bring them together with practical knowledge related to competition policy and law and then they could help Cambodia to shape the current draft law on competition to be consistent with the national and international context based on good practice and experience sharing by the competition expert during the workshop. The workshop was successfully completed on November 04, 2016 with various and useful inputs from the participants as well as from the speakers to be incorporated in the current draft law.